Rezoning South Willamette is strongly opposed. However, the high “don’t know” percentage indicates that most of the city is not paying attention to this issue. This result also points to the difference between a long-term process like Envision Eugene and the ability to convince the city’s population that a certain policy is correct. 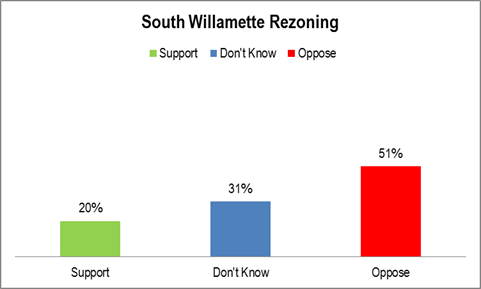 QUESTION: Do you support or oppose the South Willamette Rezoning proposed by city staff. METHODOLOGY: 200 telephone interviews of City of Eugene likely general election voters were conducted the nights of December 1-2, 2015. The margin of error at the median is 7%. Figures may not add up to 100% due to rounding.